Proof of Heaven, Proof of Love? 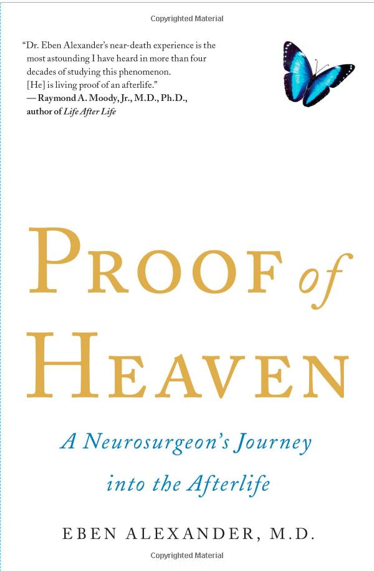 Proof of Heaven: A Neurosurgeon’s Journey into the Afterlife by Eben Alexander, M.D., takes us on a journey with him out of normal consciousness. As he lay in a coma, he journeyed “beyond this world” where he recalls that he met angelic beings and the Divine source of the universe itself. The fact that Eben Alexander, M.D., is a neuroscientist and had a near-death experience (NDE) while miraculously recovering from bacterial meningitis, has made his book a best-seller as well as brought up much discussion on NDEs and the feeling of oneness and happiness that are usually experienced in this state.